Parenting, as we know, can be the most complex, yet rewarding path in this life. Unfortunately, with all the other high stress factors in our daily lives, as parents we do get overwhelmed, we do ignore our kids, our spouses and even the things we once loved. Some days the gravity of it all may even cause us to explode in non stop trail of tears. As a mother, I know this. I also know that parenting isn’t always cushy-feely. The reality is that for every parenting reward, there are equally stressful moments. Recognizing this, Jamaican Mommies rolled out a Mini #Just Try Campaign over January and February. Essentially, compact parenting tips, all with the aim of helping us to be better parents. If you were connected with us via @JamaicanMommies on Instagram, @JamaicanMommies on Twitter or Jamaican Mommies on Facebook you would have been seeing these messages. 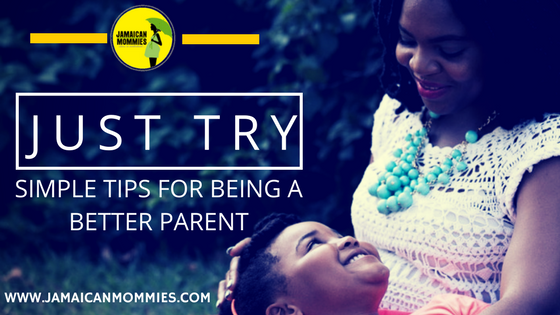 This post therefore summarizes these 10 simple tips to help you be a better parent. These tips have been so well received. Our next mission may well be to start a #JustTry Challenge. 1. 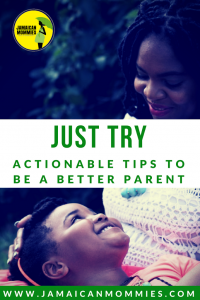 JUST TRY: As a parent, one of the most important things you could ever do is TRY. It may seem overwhelming at times but find at least one activity that you can do together weekly or every other week. Let us give our children beautiful childhood memories. Quality TIME is way more important than you know. 2. JUST BOND: Here’s a fun challenge for this weekend into the upcoming week. Set aside some special time for family. It can be as simple or as elaborate as you choose. FOCUS on using POSITIVE words and actions this week and consider it a real INVESTMENT in your home. 4. JUST TALK: It’s important that your children feel comfortable talking to you about issues happening in their daily lives! Build a comfortable talking culture! Allow them to speak! 5. JUST BE THERE: As parents it’s important to be active and present in our children’s lives. Get involved in every way possible! As a guide remember, PRESENCE over PRESENTS. What are some of the ways you TRY to be a better parent? Share with us!